The Baker “ABXX” Band Resaw is designed to maximize grade lumber production, while taking up very little space and remaining competitively priced. 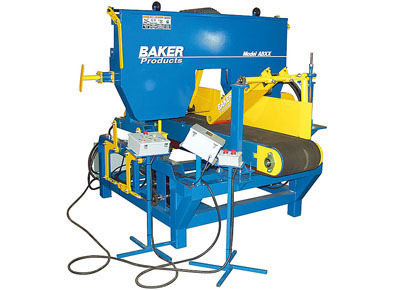 The Baker “ABXX” features a 16”wide cutting capacity. Utilizing a thin-kerf band blade, this saw wastes a minimal amount of your valuable raw material and leaves a relatively smooth finish. The headrig can be manually adjusted up or down, while the conveyor stays at a fixed height. Because the conveyor belt stays at a fixed height, it is easier to interchange and integrate with other material handling systems in your facility. The versatile, yet economical Model “ABXX” is perfect for those who need to produce quality grade lumber efficiently.